Renowned local designers Barnett, Haynes & Barnett designed the original section of the fourteen-story Hotel Jefferson, completed in 1904. The Classical Revival building was completed with stacked bay windows offering wide views of downtown, and an ornate upper section and entablature that included round windows (later reconstructed as rectangular openings). In 1928, a major addition to the west was completed when owners rebranded the hotel as the New Hotel Jefferson. The addition notably did not attempt to replicate the appearance of the original section, but instead offered a more subdued but still classically-oriented facade on Locust Street. Later the hotel was owned by Sheraton, and still later it became an apartment building of efficiency units called the Jefferson Arms. The Pyramid Companies purchased the building in 2006 and vacated its units. Then, Pyramid’s planned rehabilitation fell through when the company closed. After several years of vacancy, a partnership of McGowan Brothers Development, David Jump and Teach for America is about to start rehabilitation work of the building. The Jefferson is slated to become the new headquarters for Teach for America in St. Louis, and will also have housing and office space. The real estate firm of Martin & Breitt published the brochure reprinted here in 1928. 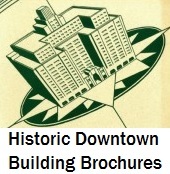 The purpose of the brochure was to market the building’s commercial spaces, not advertise the hotel itself. Is it just me, or does the current state of the Jefferson seem to be missing some of the detailing found in the illustrations? BTW, nice little series going here, Mr. Allen.